Girl Geek Dinners‘ tagline is ‘Definitely does compute’. Attending one of these events certainly does. Held at coworking space Inspire9, females working in IT congregate monthly to share their passion for the industry, ideas, knowledge and food – ok, mainly pizza. And the recent meet up was no different. Over 15 women working as web developers, mobile UX designers, social community managers, online managers, bloggers and coders gathered for a 3-hour HTML workshop. Diana Macdonald, Technical Editor from SitePoint, gave an interesting and insightful overview of the main concepts of HTML, explained how to code simple pages and shared the open source resource material of veritable Queen of the Girl Geeks San Francisco-based Pamela Fox. Learning about the anatomy of a website through to understanding HTML validators was made all the more palatable with the arrival of boxes of pizzas quickly washed down with a glass of wine. The wine was originally intended as prizes for the winners of the W3schools HTML quiz. Oh well… instead, threeof the tech savvy Girl Geeks had a choice of technical books, compliments of SitePoint. The takeaway message from the night shared by Diana was to ‘keep reading and keep researching. Things change rapidly. What was best practice one year ago in the IT space won’t be best practice today. 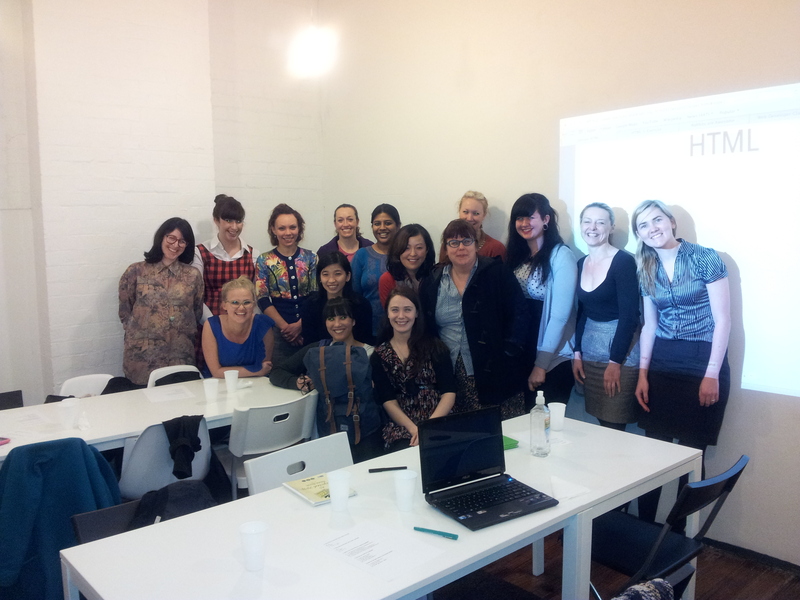 Girl Geek Dinners, which started six years ago in Melbourne, is still going strong. The regular Richmond meetup provide a learning environment where professional women are able to come together and skill up on the ever-changing and ever evolving IT sector. The vibe is friendly, enjoyable and relaxed and it caters for women with varying degrees of IT knowledge. Geek Girl Dinner organisers Tammy Butow and Jessica Lowry not only hold regular IT focused workshops but a hugely popular mentoring series. The Secrets of Success series involves a speaker or three covering a topical technical or business subject over a bite to eat. The format enables senior women with years of industry experience to share their knowledge and offer career guidance and support to those starting out. There are also opportunities to socialise at over Friday night drinks and movie nights, the last one being of course, The Social Network. There is also an invite only Yammer network available allowing for collaboration in-between meetups, as well as Girl Geel blog and Twitter. So girls, no matter how tech savy you may or may not be, get involved. Get yourself along to a Girl Geek Dinner meetup – coming workshops topics include CSS and WordPress. Have some fun, have some pizza, maybe hold back on cracking opening the wine, but don’t hold back on hollering “HTML, CSS or WordPress” instead of “Cheese” when the group photo is being taken! And guys, good news. Men aren’t excluded. If you have an invitation from a girl attending the event, you are welcome. And this ‘Definitely does compute’ where the focus of the events is about uniting, supporting, learning and having fun in the technology industry. There are a number of GGC’s across Melbourne for females studying in the IT space. Students in Computer Science, Software Engineering, Information Technology, Multimedia, Computer Games and related disciplines (e.g. Science, Engineering, and Mathematics) can meet up over coffee. Supportive males accompanied by a female are also welcome to attend. The Ada Initiative is a non-profit organization dedicated to increasing the participation and status of women in open technology and culture. It includes open source software, Wikipedia and other open data, and open social media.The group is named after Countess Ada Lovelace, widely acknowledged as the world’s first computer programmer and the world’s first woman open source programmer. Robogals is a student-run organisation that aims to increase female participation in engineering, science and technology through fun and educational initiatives aimed at girls in primary and secondary school. There is a chapter at Melbourne university. “Women are I.T.” is an organisation providing a framework upon which women in Information Technology can extend their network and expand their knowledge in an environment that encourages open conversation and debate. We want to encourage women to choose I.T. as a career and raise the status of women in Australian business, in the I.T. industry in particular. Females in Information Technology and Telecommunications [FITT] is a not-for-profit network established in 1989 that encourages and supports women in the Information and Communications Technology (ICT) industry. FITT holds events and activities throughout the year to support, encourage and inspire women in the Australian ICT industry. Go Girl, Go for IT is a free IT career showcase run by the Victorian ICT for Women network for for Secondary School Girls in Years 8-11 to experience the incredible range of vocational avenues that are available in IT. About our Ambassador // This article was contributed by Jacqueline Shields. Luckily Jacqueline is not a cat. She’d be on her ninth life. Her inquisitive nature sees her say yes to pretty much anything – a Tough Mudder, an African Safari, sailing down the Nile in a felucca and even a HTML workshop. And each and everything she tries, she takes great joy in writing about. You can connect with Jacqueline on Twitter @hillrepeats.